Price Range: Rs.1000- Rs.75000 each. 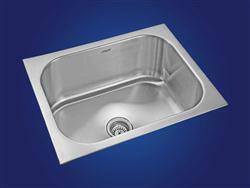 We offer an exclusive range of steel sinks that that comes with double bowls and a single board. These steel sinks enable convenient washing and provide sufficient space for drainage after cleaning. These are available in exciting designs, shapes and sizes. These are highly appreciated by the style conscious people. We design, manufacture and supply a wide range of copper farmhouse sinks as per the requirements. These copper farmhouse sinks are all single bowl sinks and are available with design plate. Our skilled artisans handcraft them in beautiful and creative designs due to which these sinks are widely demanded in the industry. We also offer them in customized and standard forms.